​we exist to support law enforcement. 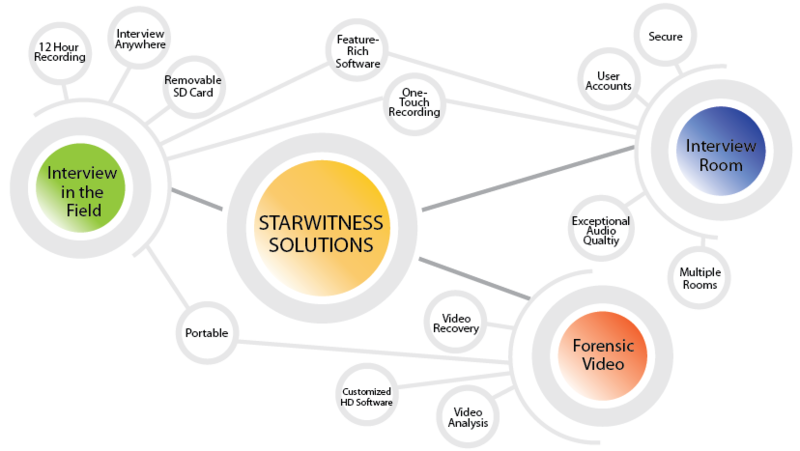 ​In the field or at your agency, StarWitness® is your solution for interview recording or forensic video and recovery equipment. ​ease-of-use, and software that holds up in court. ​We have conducted almost two hundred flawless interviews utilizing the system. It is extremely simple to use, with one button recording. In fact, several local police departments have asked us to utilize our system to assist them in their criminal investigations. I would recommend this system, and have several times, to any law enforcement agency looking for a simple yet complete system to record interviews for criminal investigations." Mount the Field Interviewer to a car's dashboard, attach it to a tripod, place it in the palm of your hand, or simply set it on a table; the StarWitness Field Interviewer records interviews in any setting. ​The StarWitness Field Agent HD Kit contains everything you need to perform successful recoveries of video evidence from digital CCTV surveillance systems at the scene of the crime. This comprehensive kit gives you the ability to capture high-quality video directly from the display of the CCTV system. ​FreezeFrame UHD software automatically imports your video, and then with the push of a button, it automatically detects and marks where motion occurs in one or more customizable regions of interest. so that you can ​spend your time keeping your communities safe.